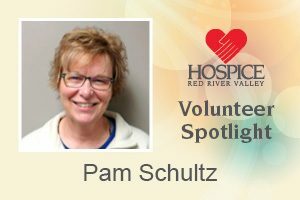 Why do you volunteer with Hospice of the Red River Valley?I’m a former hospice nurse, and now I work from home. I wanted to get back into visiting patients. Once I helped arrange a patient’s home so that he could set up a train set that he had. Knitting, wool felting to make slippers, landscaping and gardening. I like repurposing old things, such as furniture, and I love spending time with my grandchildren.